Evidence is mounting that the atmosphere of Enceladus, first detected by the Cassini Magnetometer instrument, is the result of venting from ground fractures close to the moon's south pole. New findings from the close flyby of Enceladus by Cassini this past July add to the emerging picture of a small icy body, unusual in its past and present level of activity, and very different from all other icy Saturnian moons. Within a minute of closest approach to Enceladus on July 14th, 2005, two instruments aboard the Cassini spacecraft detected material coming from the surface of the moon. The Ion and Neutral Mass Spectrometer (INMS) measured a large peak in the abundance of water vapor at approximately 35 seconds before closest approach to Enceladus, as it flew over the south polar region at an altitude of 270 kilometers (168 miles). The High Rate Detector (HRD) of the Cosmic Dust Analyzer (CDA) observed a peak in the number of fine, powder-sized icy particles coming from the surface approximately a minute before reaching closest approach at an altitude of 460 kilometers (286 miles). The character of these detections is very similar to the venting of vapor and fine, icy particles from the surfaces of comets when they are warmed by sunlight as they near the Sun. On Enceladus, however, it is believed that internal heat, possibly from tidal forces, is responsible for the activity. The close but different occurrences of the two detections are yielding important clues to the location of the vents and even the venting process. 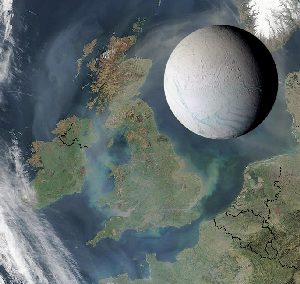 "And so the plot thickens," said Dr. Carolyn Porco, Imaging Team leader at the Space Science Institute in Boulder, Colo. "Enceladus is surprisingly warm, internally fractured and active, and we're not sure how it comes to be that its South pole is the warmest, most active place. The fact that Enceladus is so alive, and Mimas, the moon next door and roughly the same size, is so dead, is really testing our understanding of the internal workings of planetary satellites. But we're not complaining. We like it this way." Acting on the timing information, the Cassini imaging team examined images of Enceladus acquired during the same July flyby, tracing the ground track of the spacecraft across the south pole during the encounter. They noted that the maximum water vapor abundance detected by INMS occurred when Cassini was directly over one of the mid-latitude tectonic gashes that circumscribe the south polar region, suggesting at first the sub-spacecraft fracture as being the source of the vapor detected by INMS. However, the mid-latitude fracture system is not presently a source of anomalous heat on Enceladus. Previously reported, combined results from the Composite Infrared Spectrometer (CIRS) and the Imaging Science instrument (ISS) instead indicated that an array of narrow linear cracks straddling the south pole, called 'tiger stripes', is the site of at least some of greatest concentrations of anomalous heat at the surface, and that mid-latitude regions are normal and cooler. Furthermore, analysis of the timings of the INMS and CDA observations seems to indicate that the vapor and fine material are originating from the hot polar cap region, some distance away from the spacecraft's flight path, and that the two processes - production of water vapor and ejection of fine material - are connected, as they are in a comet. Recent numerical simulations by members of the CDA team at the University of Potsdam, Germany, aimed at reproducing the timing of the CDA observations, have shown that the majority of the icy grains originate from a source at the moon's south pole that is distributed along the surface, like the cracks seen in the images, and not from globally distributed impacts by Saturn-system dust particles as had been previously assumed. If this is the case, then the sharpness of the peak detected in the water vapor abundances by INMS is better explained by passage of the spacecraft through the edge of a cloud of vapor that hovers over the south pole, and not through a sub-spacecraft source as suggested by the images. The CDA analyses also shed light on the origin of the broad, diffuse E ring through which Enceladus orbits. "This new finding might explain why Enceladus is so efficient in replenishing the E ring with fresh particles," said Dr. Frank Spahn of the University of Potsdam. To arrive at a more complete and accurate picture of the surface environment on Enceladus will require scientists from the various Cassini instrument teams to combine their findings - something that will happen in the days ahead. "The exploration of the mysteries of Enceladus with Cassini's combined set of instrumentation," said Dr. Hunter Waite, team leader of the INMS investigation at the University of Michigan in Ann Arbor, "clearly demonstrates the virtue of exploring a system as complex as Saturn's using a very well-equipped flagship like Cassini." Cassini will encounter Enceladus again at very close range in March, 2008. 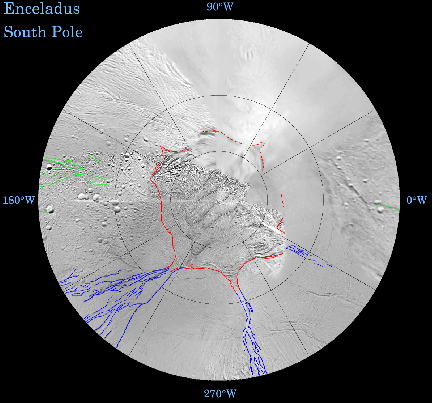 New image products showing the types of tectonic features found in the south polar region of Enceladus, as well as the Cassini ground track and the INMS and CDA results, can be found at http://ciclops.org, http://saturn.jpl.nasa.gov, and http://www.nasa.gov/cassini. More information on the INMS and CDA observations can be found at http://aoss.engin.umich.edu/news/04-05_news/Cassini.php. The Cassini-Huygens mission is a cooperative project of NASA, the European Space Agency and the Italian Space Agency. The Jet Propulsion Laboratory (JPL), a division of the California Institute of Technology in Pasadena, manages the Cassini-Huygens mission for NASA's Science Mission Directorate, Washington. The Cassini orbiter and its two onboard cameras were designed, developed and assembled at JPL. The imaging team consists of scientists from the US, England, France, and Germany. The imaging operations center and team leader (Dr. C. Porco) are based at the Space Science Institute in Boulder, Colo. The Ion and Neutral Mass Spectrometer and team leader (Dr. H. Waite) are based at the University of Michigan. The Cosmic Dust Analyzer and principal investigator (Dr. R. Srama) are based at the Max Planck Institute for Nuclear Physics in Heidelberg, Germany, and the High Rate Detector (HRD) was designed and built by the University of Chicago (team leader Dr. A. Tuzzolino).